What is Outline Agreements? Where it fits in purchasing process? The outline purchase agreement is often referred to as a blanket or umbrella purchase order. It is basically a long-term agreement between the purchasing department and vendor for material or services for a defined period of time. The purchasing department negotiates with the vendor a set of terms and conditions that are fixed for the period of agreement. Which business requirements lead to use of outline agreement? Document header: contains information relating to the entire agreement. For example, the vendor information and header conditions are in the document header. A contract is a longer-term agreement with a vendor (one of the two forms of “outline agreement” in the SAP system) to supply a material or provide a service for a certain period of time. 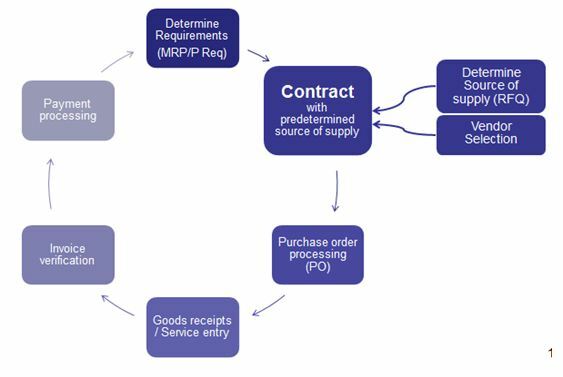 A number of different terms may be used for this concept in purchasing literature, including “blanket order”, “blanket contract”, “systems contract” and “period contract”. The contract does not contain specific delivery dates or the individual delivery quantities. These are specified subsequently in release orders issued against the contract when customer requires them. Value contract (MK) : The contract is regarded as fulfilled when release orders totalling a given value have been issued. Use this contract type when the total value of all release orders should not exceed a certain amount. Quantity contract (WK) : The contract is regarded as fulfilled when release orders totalling a given quantity have been issued. Use this contract type when the total quantity to order over the duration of the contract is known. Manually: Enter all the contract data manually. Contracts are outline agreements. They do not contain details of the delivery dates for each of the items. To inform vendors of which quantity you need for which date, you enter contract release orders for a contract. A release order is a purchase order that references a contract. If a purchasing information record with conditions exists for the material and the vendor, the system automatically suggests the net price according to these conditions when you create the contract item. 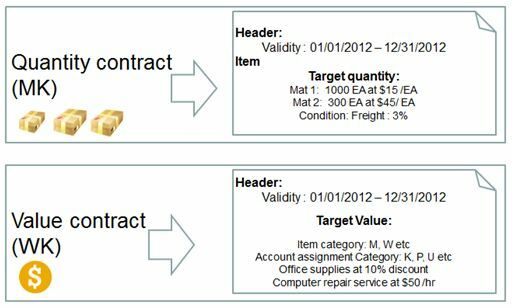 For each item in a quantity contract, you define the target quantity and purchase order conditions. Item category M is recommended for similar materials with same price but different material numbers. For example, contract for copier paper. Item category W is recommended for material belonging to the same material group but with different prices. For example, contract for office supplies. Item category W can be used only in value contracts. 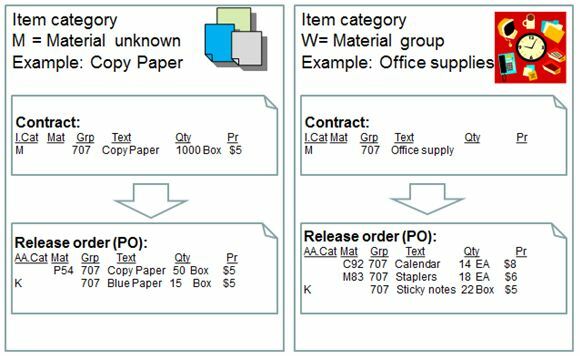 Item category M and W are not allowed in contract release orders. Item category D is used for services contracts. Account assignment category, ‘U’ unknown can be used in contracts. In this case, cost center will be determined at time of creating release order. The account assignment category, ‘U’ is denied in contract release orders. You have to replace the account assignment category with a valid account assignment category. Contract release orders are purchase orders that are created with reference to contract. The release order documentation (i.e. the quantity released until now, and the open quantity) is automatically updated when you create a contract release order. This can be used for monitoring the contract. The release order document is contained in the statistics for contract item. You can enter source of supply in the purchase requisition. This ensures that the outline agreement is referenced when the purchase requisition is converted into a purchase order. Contract release order can be created with or without reference to a purchase requisition. The centrally agreed contract allows a central purchasing organization to create a contract with a vendor that is not specific for just one plant. In this way, the purchasing organization can negotiate with a vendor by leveraging the whole company’s requirements for certain materials or services. Using the plant conditions function, the centrally agreed contract allows you to stipulate separate prices and conditions for each receiving plant. For example, different transport costs.